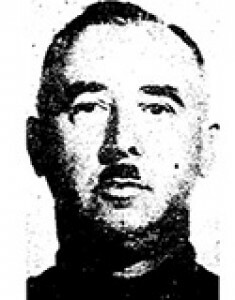 Deputy Sheriff Otto Ellinger was shot and killed by a man who had just shot a woman whom he was infatuated with. Deputy Ellinger, who also served as a captain with the MGM Studio Police Department through a contract with the sheriff’s department, was driving home from a meeting with other peace officers when he saw the woman and a friend near the intersection of Vinton Street and Venice Boulevard, in Culver City. He recognized the women as being employees of MGM Studios and pulled his car over to talk with them. As they spoke the male subject approached the woman, pulled out a handgun, and shot her without warning. Deputy Ellinger exited his vehicle and started struggling with the subject, but was also shot. He was transported Culver City Community Hospital where he died a short time later. The subject who shot Deputy Ellinger later pleaded guilty to manslaughter. Deputy Ellinger had served with the MGM Police Department for five years.